TUBELIGHT is a story about a man’s unshakeable belief. Based on the adage, ‘Faith can move mountains’, the film revolves around the life of a simpleton named Laxman Singh Bisht (Salman Khan). Because of his exceedingly gullible nature, he gets nicknamed as ‘tubelight’, thanks to his inability to grasp, understand and analyse things like others. The story starts off with a narration by Laxman, wherein he takes the audiences through his childhood to adulthood. While the world doesn’t take him seriously, the one man who always stands by Laxman and has complete faith in him is his younger brother Bharat Singh Bisht (Sohail Khan). One day, in the wake of the Indo-China war, the Indian Army invites applications from young Indians to join the army and serve the nation at the time of crisis. While Laxman gets rejected outright, Bharat gets chosen to be a part of the Indian army to go to the border to fight against the Chinese invasion. Life falls apart for Laxman when he gets to know that there is no contact with Bharat and that he may have died in the war. That’s when Banney chacha (the late Om Puri) tells Laxman to have faith that his brother Bharat will return. Does Laxman Singh Bisht’s faith fight the test of time, does Bharat Singh Bisht return back home safely, and what happens ultimately of the Indo-China war is what forms the rest of the film. 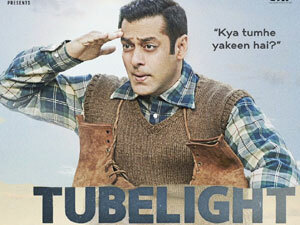 While the promos of TUBELIGHT simply ‘lightened’ up everyone’s excitement about the film, the film fails to live upto its title and eventually falls flat completely. The film’s story (Kabir Khan) is raw, extremely half-baked and totally convoluted. The film’s screenplay (Kabir Khan, Parveez Shaikh) is very convenient and rests on a wafer thin plot that gets stretched way too long, thus, spoiling the film’s novelty in a big way. The screenplay seems to have been born out of convenience rather than conviction. Even though the film has been based on the adage ‘Faith can move mountains’, TUBELIGHT just does not hold any kind of solid content to mirror the same. The film is not at all convincingly made in the context of a backdrop of a war as it lacks the emotional connect with the audiences. The film’s dialogues (Manurishi Chadha) are just about average and very much unlike a typical ‘Salman Khan film’. After having started his career working on documentary films, director Kabir Khan gradually progressed into Bollywood with films like KABUL EXPRESS, NEW YORK, EK THA TIGER, BAJRANGI BHAIJAAN and PHANTOM. Known for his peculiar style of filmmaking and for his knack of extracting exemplary performances from his actors, one expects Kabir Khan to continue this tradition with TUBELIGHT as well. But, sadly he disappoints this time. Even though Kabir had a very interesting premise, he fails to convert the same into a good and an engaging entertainer. While the film’s first half is decent, the second half starts moving at an extremely slow pace with absolutely no story to boast about. While there are lots of elements which have been taken for granted in the name of cinematic liberties, there are absolutely zero elements which invoke a shock value in the dragged second half. Speaking of scenes worth noticing, do not miss the scenes wherein Salman Khan undergoes a selection process to join the army as well as the scene which has Shah Rukh Khan in a cameo. After having given smash hit films like KICK, BAJRANGI BHAIJAAN and SULTAN, expectations were sky high from Salman Khan’s TUBELIGHT. Salman Khan plays his part with utmost sincerity and dedication but it’s the script which fails him bitterly. Even though Salman Khan tries to be naïve and affable, the film’s poor writing gives him in. Ditto for the Chinese actress Zhu Zhu, who makes her debut with TUBELIGHT. While she is endearing to watch, the weak script fails to escalate the impact of her performance. The Indian audiences will find it tough to relate to her (half-baked) character in the film. The little boy Matin Rey Tangu is cute and endearing in his character, but doesn’t get to do much. Sohail Khan, on the other hand, is convincing in his extended cameo kind of role and plays his part with sincerity. The (late) Om Puri delivers a memorable performance, while Shah Rukh Khan’s cameo is effective. Rest of the actors help the film in move forward. The music (Pritam) of TUBELIGHT is very average. ‘RADIO’ is the only chartbuster song in the film. On the other hand, the film’s background score (Julius Packiam) is good. The film’s cinematography (Aseem Mishra) is excellent. The way in which he has captured the locations are worth mentioning. The film’s editing (Rameshwar S. Bhagat) is decent, if not outstanding.